Indian Railways e-Procurement System (IREPS) portal was launched in 2008 (25th August) for procurement of materials in Indian Railways through e-tendering. Till FY 2013-2014 this portal was majorly being used by Stores Department of Indian Railways for e-procurement of materials and that time about 1.1 Lakhs tenders per year was being published through this portal. After that, Engineering Departments, Medical Departments, Works Department, Depots and Division of Indian Railways also added to this portal for procurement of materials. 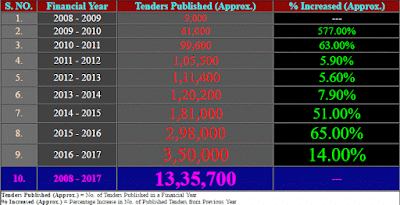 If you see the data of last Financial Years (2016-17) then you will find that 3.5 Lakhs tenders has been published through Indian Railways e-Procurement System (IREPS) portal for FY 2016-17. It means on average 950 tenders per day is being published through IREPS portal and it is continuously increasing day by day. Indian Railways e-Procurement System (IREPS) portal is not only for publishing the tenders by different Railway Zones and Production Units. When tender becomes published on this portal then registered vendors/bidders submit their financial bids online through this portal. Once tender becomes closed for bidding then Railway Officials open the tender through this portal. For more details about the e-tendering process running by Indian Railways e-Procurement System (IREPS) please Click Here.